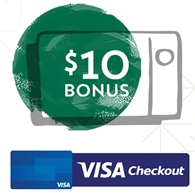 Amazon and Chase today introduced the new Amazon Prime Rewards Visa Signature Card, which offers 5% back on all Amazon.com purchases, 2% back at restaurants, gas stations and drugstores and 1% back on all other purchases. The card does not charge an annual fee. Existing Amazon Rewards Visa Signature cardmembers will automatically be upgraded to the new version of the card and be able to immediately enjoy 5% back, provided they have an eligible Prime membership. For a limited time, the Southwest Rapid Rewards Premier Business Card is offering 60,000 points when you spend $3,000 on purchases in your first 3 months of cardmembership. This is the most lucrative promo ever offered by the card. Through December 31, 2016, you can get a $20 Walmart eGift Card when you spend $100 or more with any American Express Card using Walmart Pay. The $100 must be spent in a single transaction. Limit of one bonus per Walmart Pay account. Visa Checkout is anticipating that the 2016 online holiday shopping season will be the busiest ever. And they’re hoping that you’ll spend some of your holiday dollars with them. To that end, they’ve partnered with a number of merchants to provide some enticing deals. Current and upcoming promos include offers from 1-800-Flowers, Best Buy, Fandango, Gymboree, NewEgg, Rakuten, Shuttefly, Staples and more. Read on for the details. Visa Checkout and Fandango are bringing back their popular free movie ticket deal again this weekend. From November 18 through November 20, when you buy 2 or more movie tickets on Fandango using Visa Checkout, you’ll get one movie ticket in your order for free. To take advantage of this offer, order two or more movie tickets in a single transaction either on fandango.com or via the Fandango app, then use promo code DEALSTHATCLICK2 and pay with Visa Checkout. Complete your trips, originating from select airports listed below, before December 31, 2016. The $65 will automatically be taken off the total cost of the ride once the trip has ended. Credit Card Watcher has been tracking and reviewing the best credit card offers since 2006. Follow to make sure you don't miss a deal!